We're Hard At Work Crafting Your Solution Right Now And We’ll Be Calling You Soon! A Top Rated National® Banker From Community 1st National Bank just received your eligibility request and is reviewing all information to provide current interest rates and a FREE one-on-one consultation. Please continue browsing our site or call now to speak with us directly about your request. In A Rush, Want To Skip To The Front Of The Line, OR... Do You Need A Pre-Approval Letter To Make An Offer Right Now? Go straight to the top of the VIP line by completing an online application right now. By doing so you'll be taken to the application page for Richie Duncan, Our Top Rated National® Banker at Community 1st National Bank. We will get notified immediately that you completed a full application, then we will call you to confirm all information before processing the pre-approval and starting the process, most cases we can run the approval over the phone with you. CLICK HERE TO COMPLETE AN ONLINE APPLICATION NOW & RUSH TO THE FRONT OF THE LINE! 98.00% Of BuildBuyRefi Customers Rate Us 5 Stars & Would Recommend Us To Friends & Family. 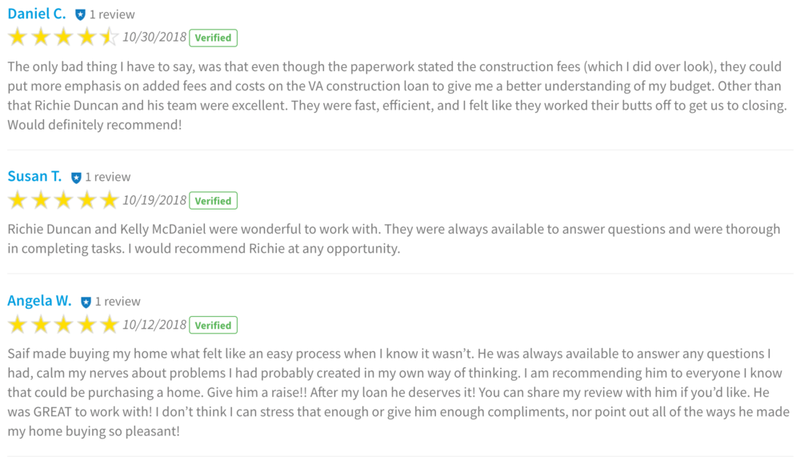 Here is just A Few Of Our Reviews. Thank you for taking the time out of your day to check your eligibility and be on the lookout for a response!